The Intelligence Bureau (IB) has warned Jammu and Kashmir's local administration that sympathisers and cadres associated with the banned organisation may disturb law and order situation in the Valley. Jammu and Kashmir's ex-Chief Minister Mehbooba Mufti has also raised questions over banning the organisation and has claimed that this would turn Kashmir into open jail. New Delhi: The Intelligence Bureau (IB) has warned Jammu and Kashmir's local administration to keep a watch on sensitive locations in the valley after the government of India has imposed a ban on Yasin Malik led Jammu and Kashmir Liberation Front(JKLF). It is expected that sympathisers and cadres associated with the banned organisation may disturb law and order situation in the Valley. IB has also said that stone-pelters who were majorly associated with JKLF may plan violent protests which can cause stone pelting in at least 6 areas. But on the other side, government sources claim that the government has acknowledged all security factors. "The security forces have already been added up in the Valley due to elections. A major part of the forces may stay there for some time if something happens in Jammu and Kashmir," a government official said. Meanwhile, Jammu and Kashmir's ex-Chief Minister Mehbooba Mufti has also raised questions over banning the organisation and has claimed that this would turn Kashmir into open jail. "Yasin Malik renounced violence as a way of resolving J&K issue a long time ago. He was treated as a stakeholder in a dialogue initiated by then PM Vajpayee ji. What will a ban on his organisation achieve? Detrimental steps like these will only turn Kashmir into an open-air prison," Mufti tweeted. According to sources, a significant part of the security forces has been placed in eight different locations so that in case of any law and order issue, they can reach and control the situation within few minutes. Local police have been asked to gather intelligence so that government can diffuse the plan of anti-national trying to disturb law and order in Jammu and Kashmir. 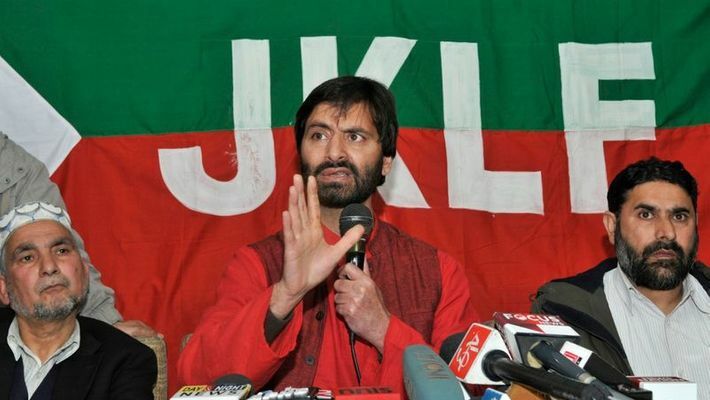 Central Government in its pursuit of strong action against terrorism, on Friday, declared JKLF (Yasin faction) as an unlawful association under the provisions of Section 3(1) of the Unlawful Activities (Prevention) Act, 1967. "Activities of JKLF pose a serious threat to the security of the country and are prejudicial to the territorial integrity and sovereignty of India. The organisation has been actively and continuously encouraging, feelings of enmity and hatred against the lawfully established Government as well as armed rebellion. 37 FIRs have been registered by J&K Police against JKLF. CBI registered two cases including the case of the murder of IAF personnel. National Investigation Agency has also registered a case, which is under investigation." Ministry of Home Affairs said.